A gallery that takes advantage of a beautiful space, displays a wide range of interesting work in a well-designed and thoughtful way AND feels comfortable and unpretentious? These kind of galleries are my happy places. 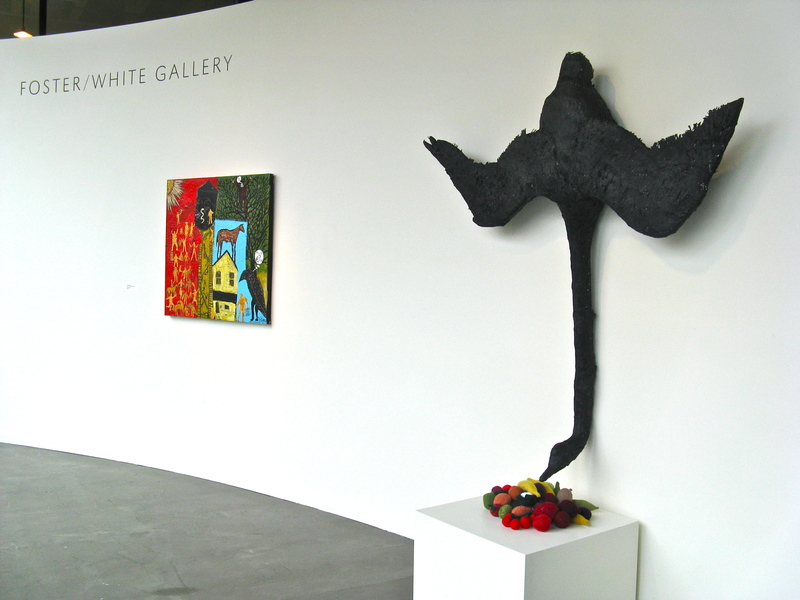 Foster/White Gallery in Seattle definitely qualifies for a spot on that list. Thanks to our time in Seattle being super limited and the tiny brain melt in which I somehow forgot that almost all galleries are closed on Monday, our only full day there and the day I’d planned to do lots of gallery hopping, I had to narrow down my galleries to visit to A) shows I really wanted to see and B) galleries that were close together. So we took a few hours before leaving on Tuesday to visit Greg Kucera Gallery, Grover Thurston Gallery ( more on that show next week ) and Foster/White Gallery, which was by far our favorite overall gallery experience. Foster/White has been on my list of galleries to visit for quite a while and when I saw that they were showing Rachel Denny’s work, it quickly went to the top of the list for our time in Seattle. But I’m one of those people that saves the best for last, so while I saw Rachel’s work out of the corner of my eye upon entering the space, there were so many other wonderful works around each corner that I made my way around the whole gallery before I spent some time with Rachel’s amazing sculptures. 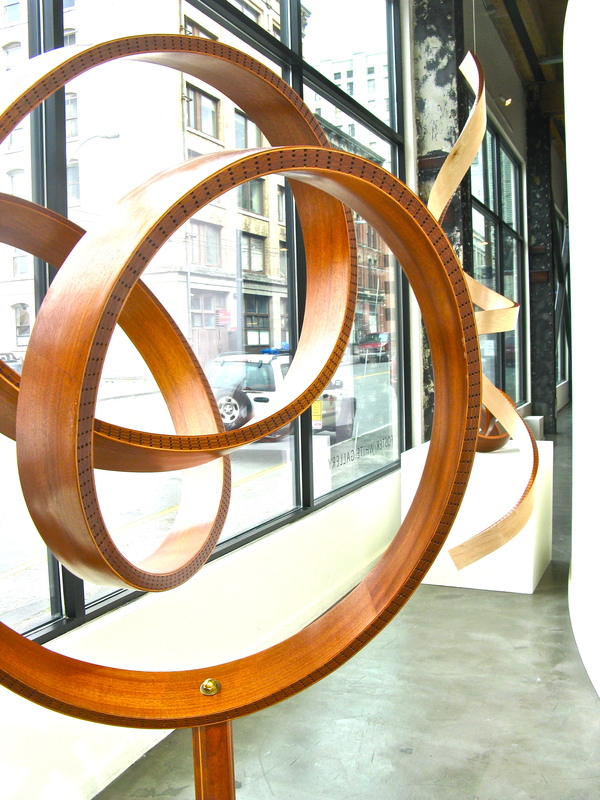 Speaking of amazing sculptures, these bent wood pieces by Paul Vexler were exquisite. The way the grain of the wood caught the light from the window drew attention to those beautiful curves. 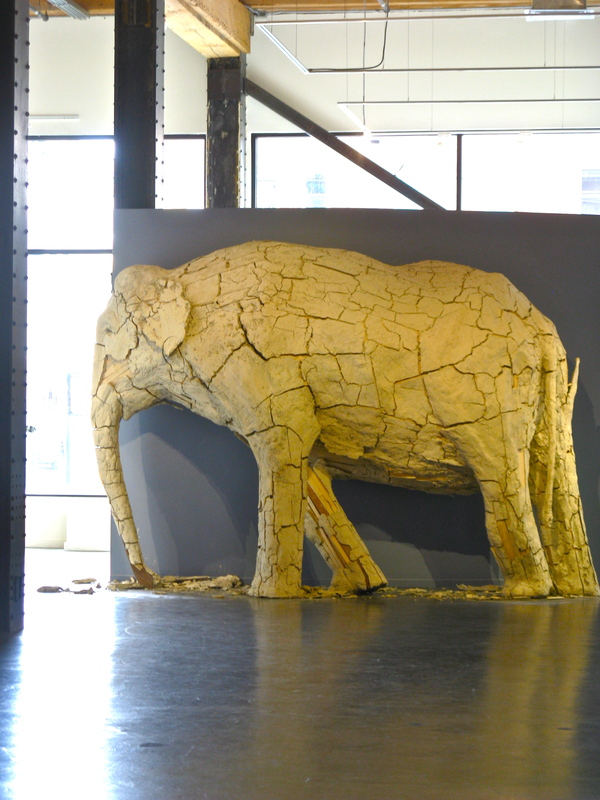 As impressive as his work was ( and there is a large hanging piece in the F/W lobby that is to die for ), Cookie the elephant by Shay Church both delighted me and drew me in. Cookie is part of Church’s Wet Clay series, site specific installations consisting of a wooden armatur covered with clay and sand. In this series, Church focuses on elephants and whales, gentle yet imposing creatures who must survive long migrations. With each passing year, those migrations grow more and more dangerous and daunting for these animals. Cookie leans into the wall for support, seeming to struggle to stand. As the clay has dried, it has begun to crack and fall, adding to the emotional impact of the piece. We are watching Cookie deteriorate before our eyes. 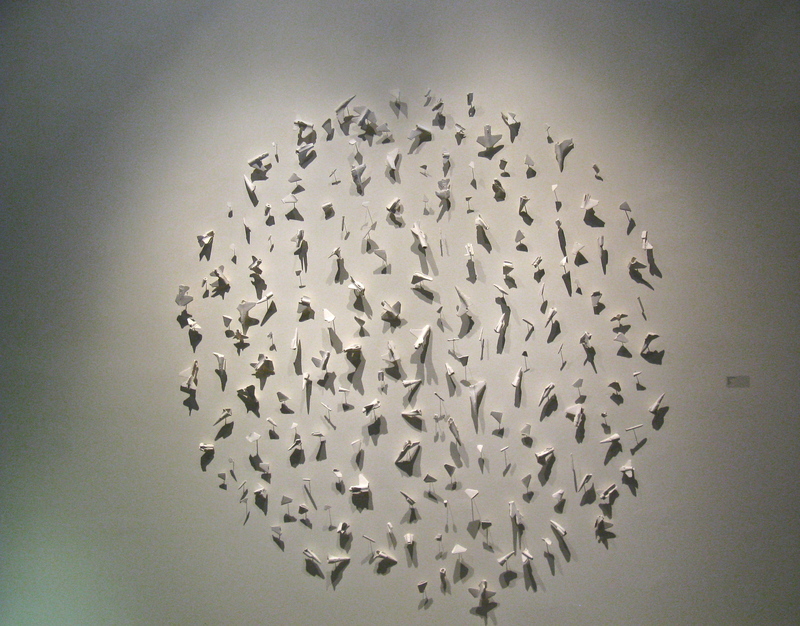 Another installation that caught our eye was Bone Yard by Evan Blackwell. 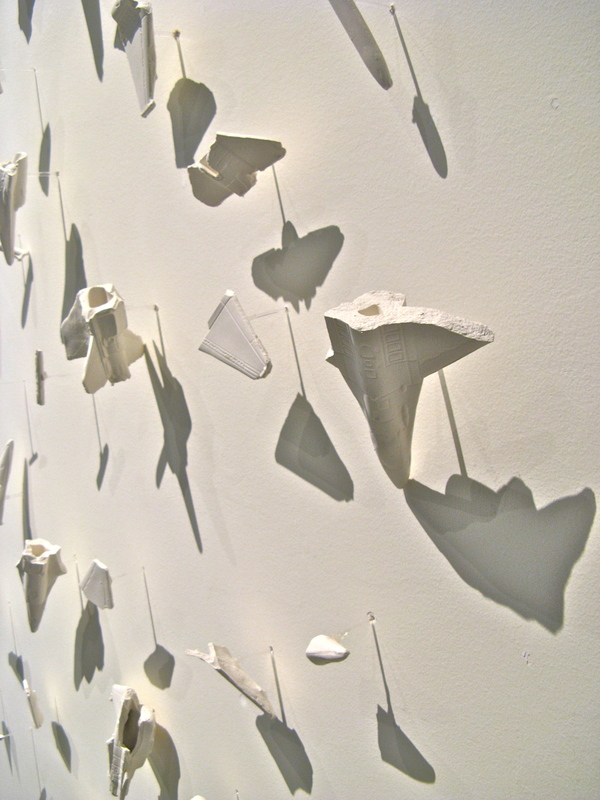 The white clay pieces, pinned to the way may appear to be fragments of bone, but upon closer inspection, we see that they are actually broken pieces of model jets. Perhaps a commentary on our military policies? Or our desensitization to such destruction? The abstract, colorful reflection of Staccato Surface by David Alexander had unbelievably lovely gestural movement and a gorgeous palette. Photos do not do it justice! Finally we made our way over to Rachel Denny’s work. I’ve been a huge fan of her work since the very first time I saw one of her Domestic Trophies online and have been looking forward to finally seeing her sculptures in person. I was blown away by just how intricately constructed they are, their palettes & construction perfectly designed to catch and direct the viewer’s eye. I was just as delighted by her work as I’d hoped to be. To see more of each artist’s work and more of the amazing work on display, please visit the Foster/White Gallery website. 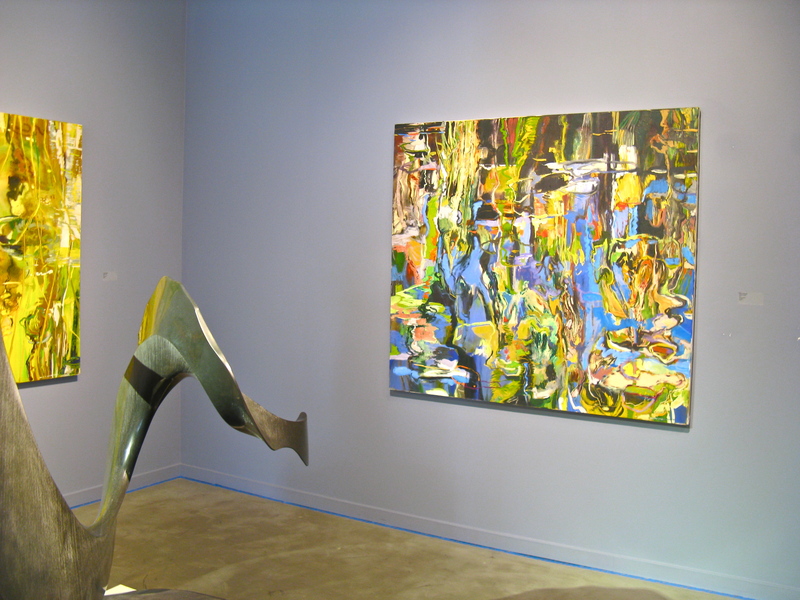 If you’re in Seattle, Rachel Denny & Casey McGlynn’s current shows will be up until April 28, 2012. I highly recommend a visit! Check out my guest post over on the Go Navis blog! 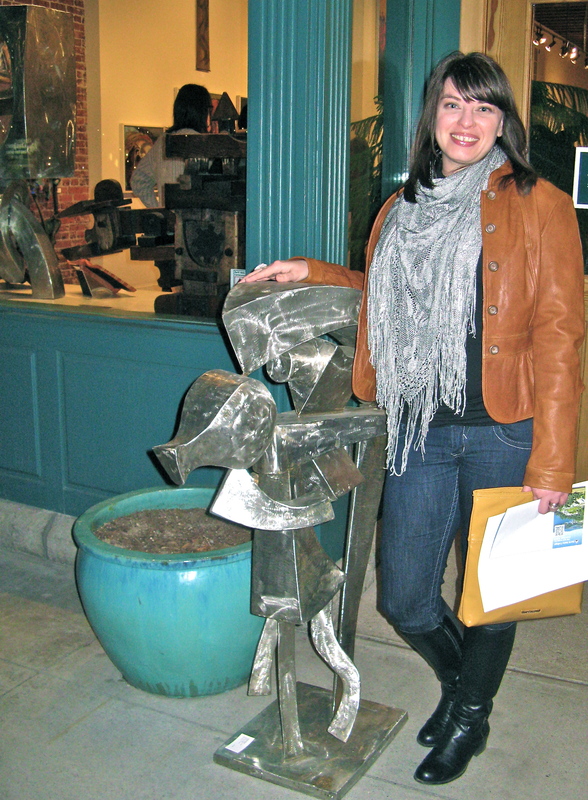 I’ll give you a little tour of one of my favorite Artsy spots– Ashland, Oregon. I am not a knitter. Nor do I crochet, weave or macrame. I tried crocheting in my middle school Home Economics class and, let’s just say, I didn’t get it. And all that knit 1, purl 2 stuff? Just sounds like math to me, which is to be avoided at all costs. But I love woven textiles. 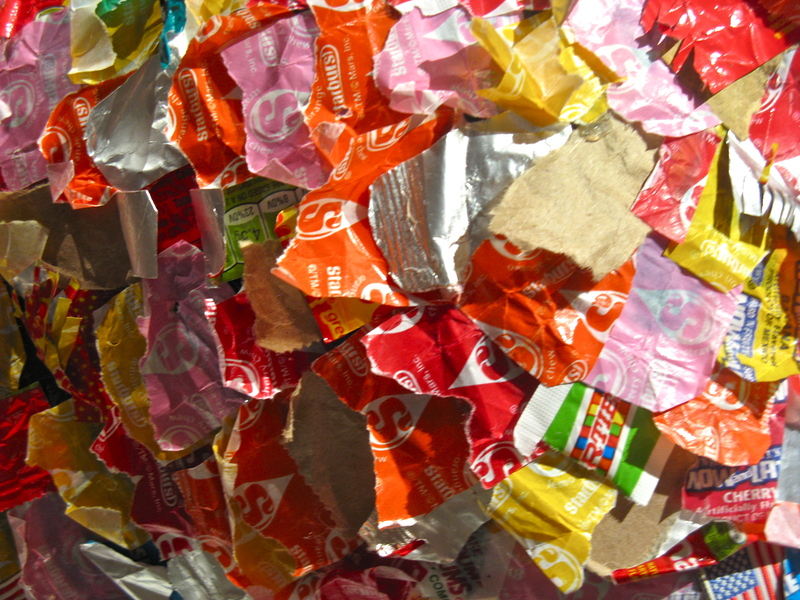 There is such an innate beauty in the patterns and texture create. 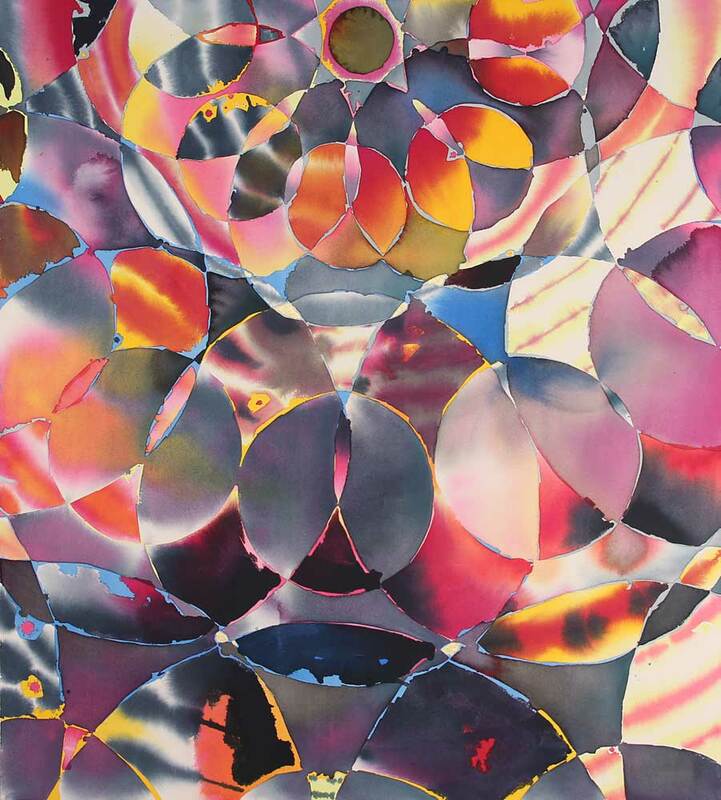 Los Angeles artist Hadley Holliday’s exhibtion, Warp and Weft at Taylor De Cordoba Gallery is weaving together a caliedoscope of color and pattern. She is exploring the worlds of space and depth and the illusions created by overlapping shapes and patterns. 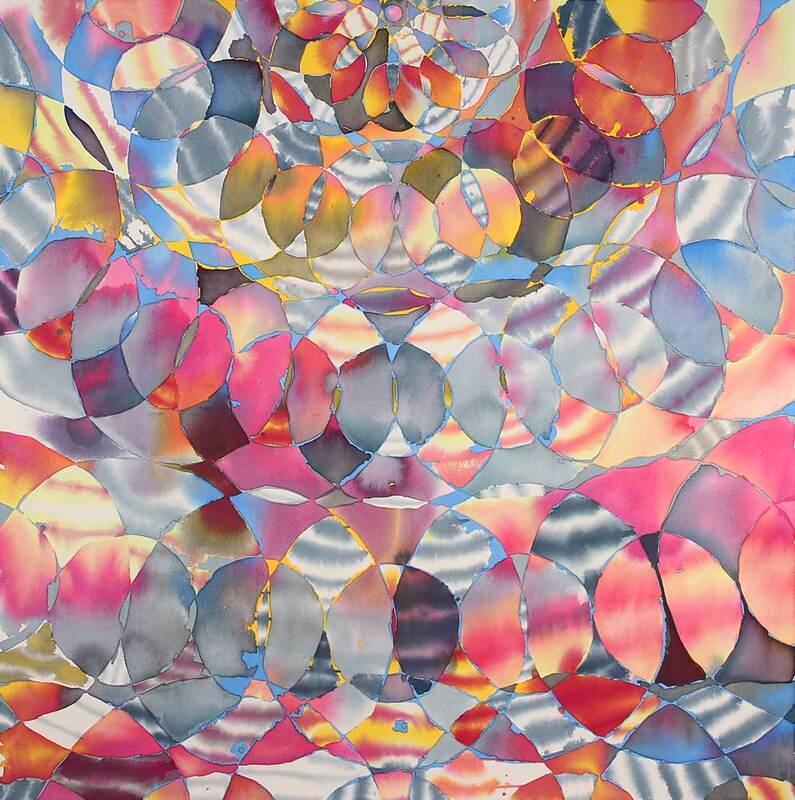 There is a fantastic sense of movement and prismatic expanse to her paintings. They seem optically illusional in nature, yet there is also an organic quality to them, reminding me of the intersecting lines and orderly nature of a spider’s web. To see more of Hadley Holliday’s work, please visit her website. If you happen to be in Southern California, you can see Warp and Weft at Taylor De Cordoba Gallery only until this Saturday, April 7th. So get moving and see it this week! 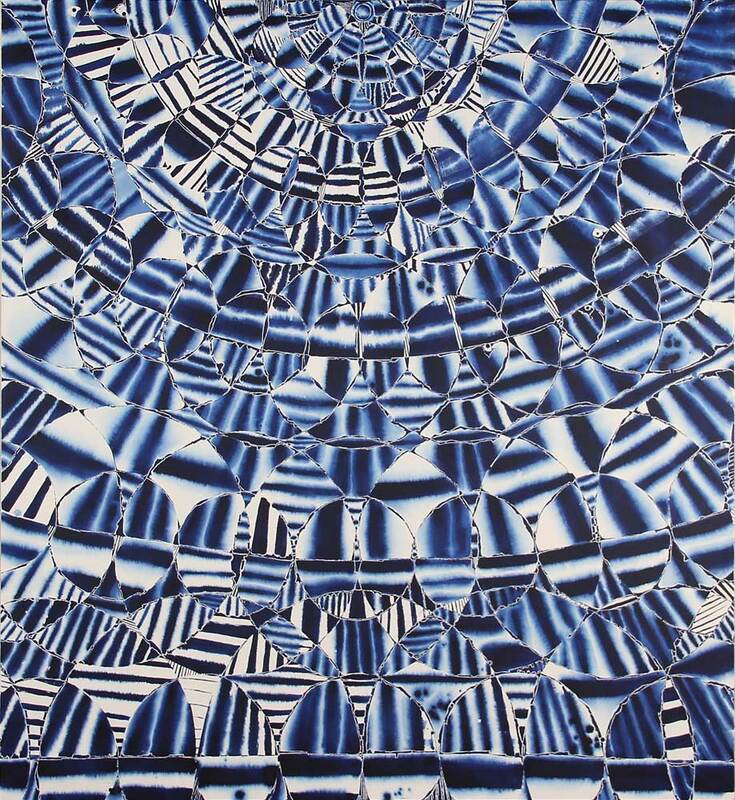 Featured image is Sun Vault ( detail ), acrylic on canvas, 63×63. All images are via the Taylor De Cordoba website. As the hubby and I travel, we try to experience as much of each area’s culture as we can. Last Friday evening, we decided to meet a friend for a night filled with our favorite things– delicious food & drink, stimulating conversation and fabulous art! I can’t imagine what could be better. 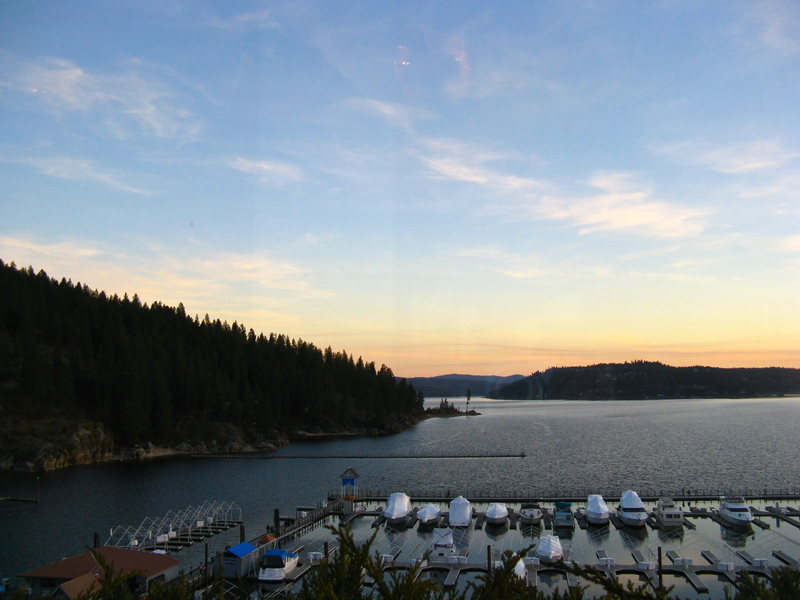 Of course, it doesn’t hurt that this ( below ) was our view for cocktails! We discovered the happy hour at Beverly’s and this was our second week in a row partaking of the fancy food & drink at affordable prices. I have a feeling it may be a weekly habit for the rest of our time here.. hubby George is addicted to their truffle fries, while I am just addicted to fries of any sort! 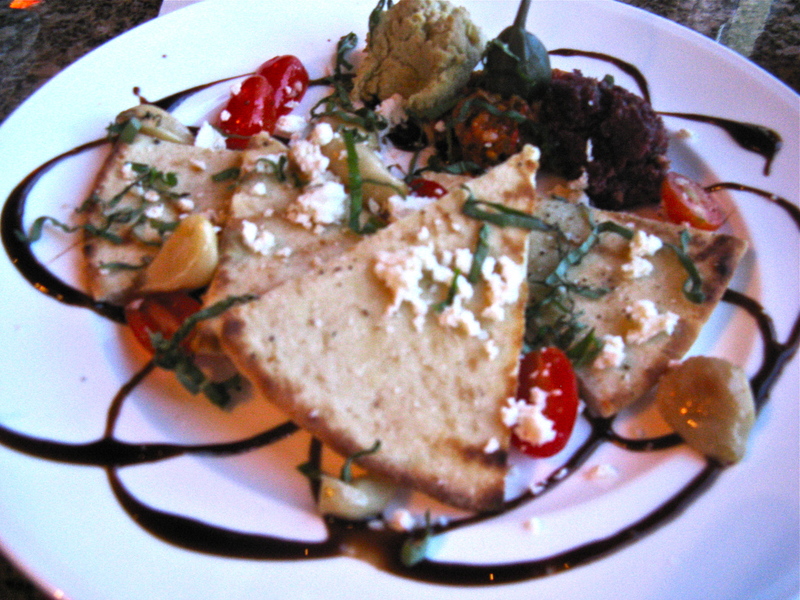 As yummy as the fries were, they just weren’t nearly as pretty as our Hummus Plate. I am a firm believer that we eat first with our eyes, so I love a colorful, artsy presentation of food! 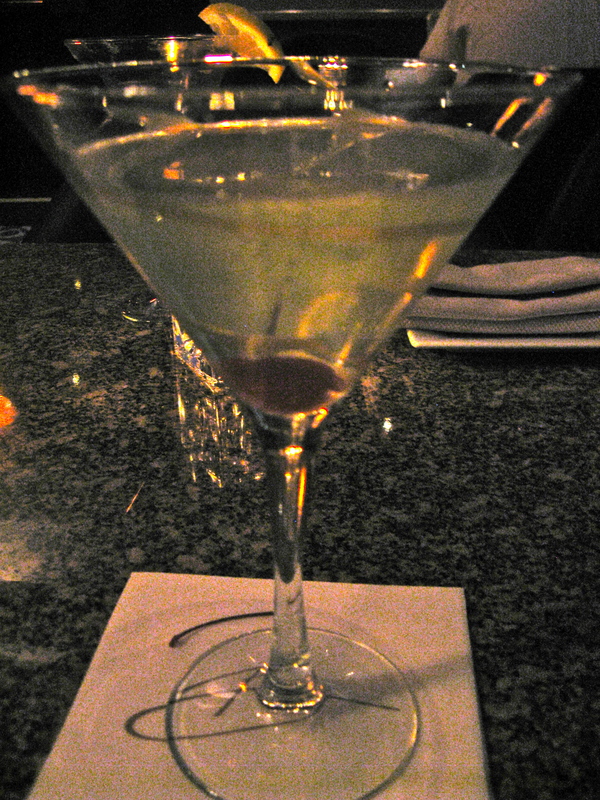 Cocktails and conversation flowed, as we shared the truffle oil-doused (!) complimentary popcorn with our friend and fellow traveler, Kirsten. This lifestyle we’ve chosen is fairly unique, so travelers always seem to bond together, sharing stories and experiences. 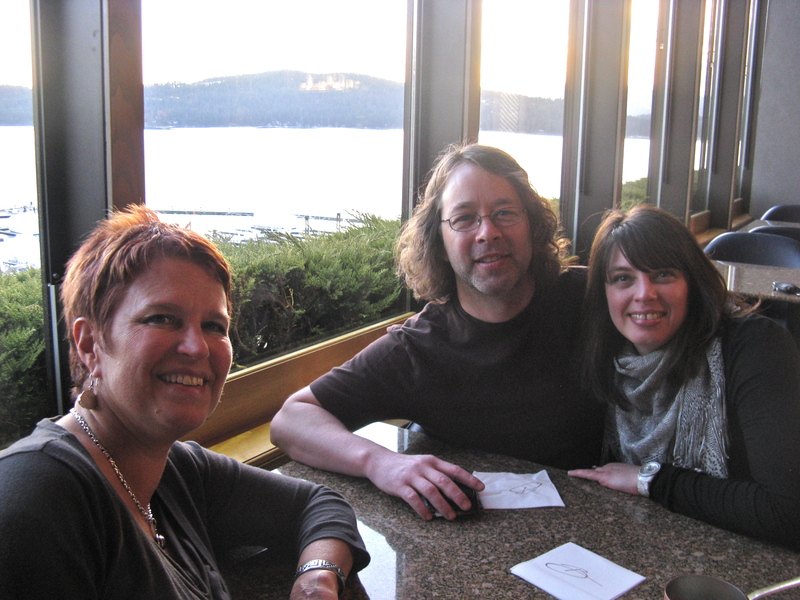 There is a great sense of camaraderie in knowing that there are others living such a crazy, wonderful life! It was a beautiful night in Northern Idaho, so we strolled downtown to The Art Spirit Gallery to attend the opening of their current show, Portraits by artist Dan Spalding. 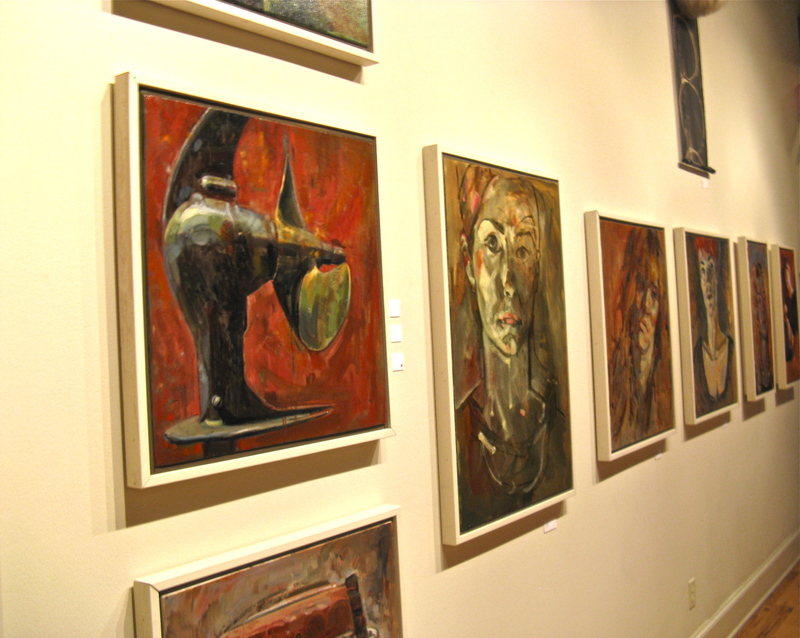 The Spokane, WA painter’s exhibition centered around his beautifully textured and expressive portraits. His use of light is really incredible, giving his work a raw, emotional power. 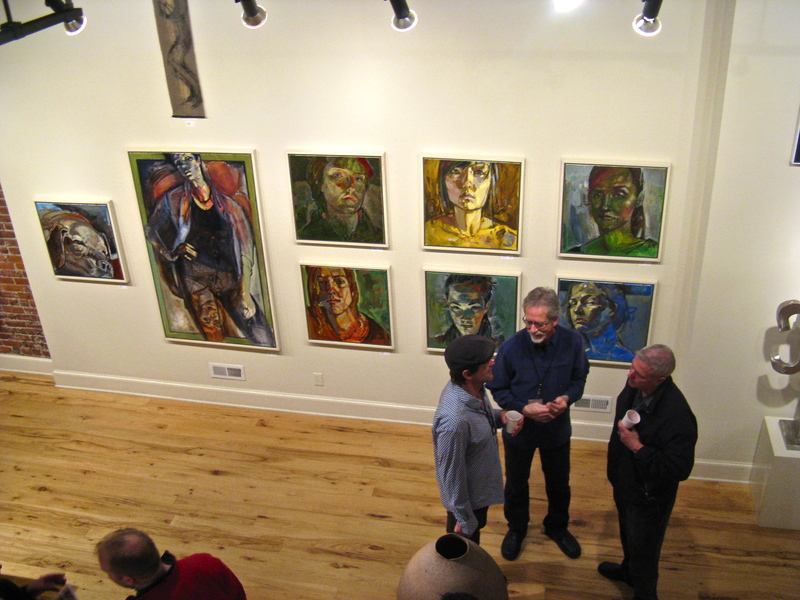 But I do love the energy of exhibition openings and ArtWalks. Seeing crowds of people enjoying and talking about art gives me goosebumps! And I am always thrilled for the gallery & artist when I see lots of red dots! ( As I did last night– can you spot the one visible in the pic above? ). What I really love about attending openings with my husband and friends is the conversations about the work we are drawn to and why. For an non-artsy person, George actually has a fantastic eye! 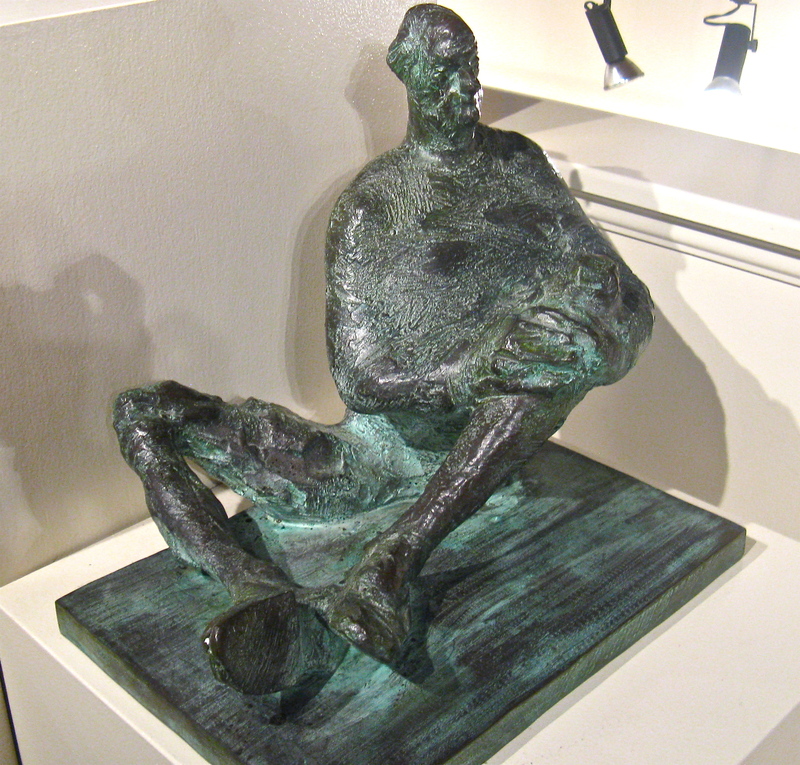 He really loved the sculptural work of Simon Kogan ( below ). 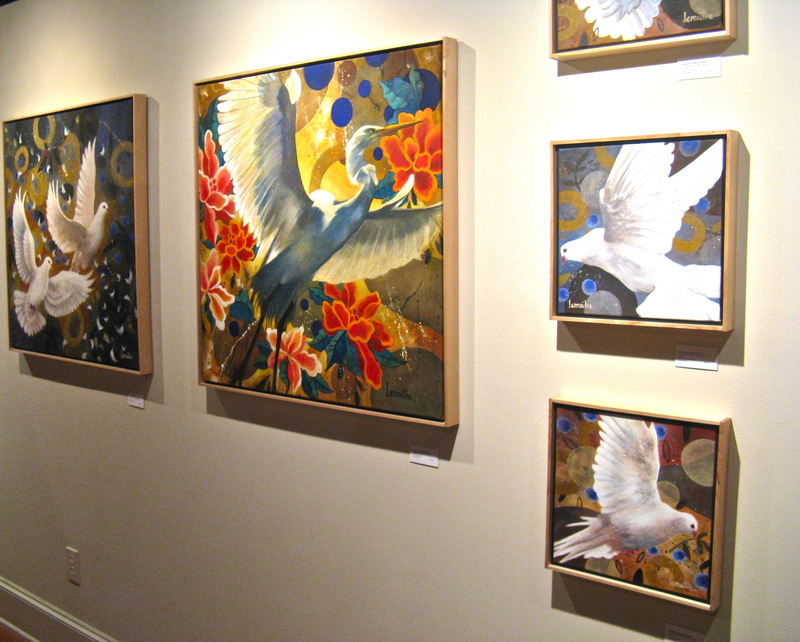 While I loved these stylized bird paintings from North Idaho artist Catherine Lemaitre Earle. Aren’t they lovely? All in all, a delightful evening, artsy in every wonderful way! How about you? Any artsy fun to be had this weekend? 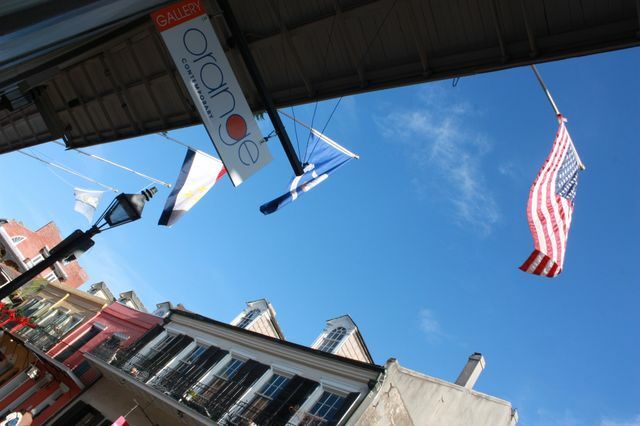 In the heart of the New Orleans French Quarter, housed in a 200+ year old classic Creole building lives Gallery Orange, a contemporary fine art gallery whose vibe and vision match the freshness of its signature color. If you’re a regular Artsy Forager reader, you’ve heard of Gallery Orange before. 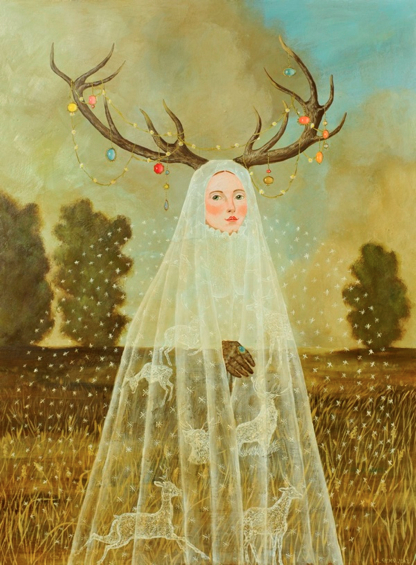 I first found GO when I discovered the work of Sarah Ashley Longshore, which then led me to Gallery Orange, her exclusive representation in New Orleans. I found gallery owner Tracy Geilbert’s aesthetic and taste to be quite similar to my own and have been happily watching her list of artists grow and work by those artists flying off the walls! Tracy’s love of art and enthusiasm for original work is infectious, I’ve never seen a gallery promote their artists harder than she does! Owner Tracy Geilbert was already selling art at a young age, making sketches of Duran Duran, photocopying them and selling the “prints” to her classmates. ( Ah, a fellow 80’s girl! ) Part Dutch and part British, Geilbert studied art and eventually graduated from the Royal Academy of the Arts at The Hague. Life would eventually take her to post-Katrina New Orleans and, after working for another high-end New Orleans gallery, heeded the call of her heart to open a space of her own. 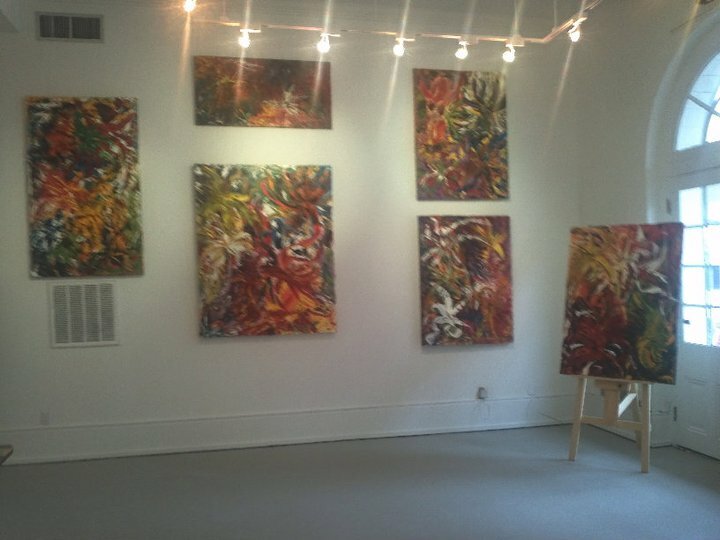 Starting in a tiny 600 square foot space, with only two artists on her roster, Tracy’s hard work and eye for unique talent led to the gallery’s current space on Royal Street where boutique galleries are springing up and blazing new trails on the New Orleans art scene. 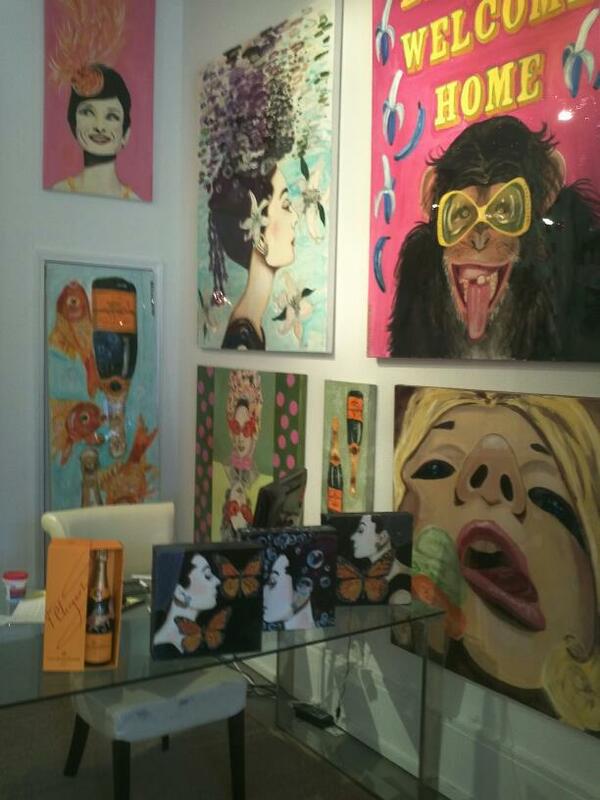 Tracy brings her Dutch artistic sensibilities to the gallery, offering only exceptional original work ( no giclees here! ), creative energy galore and a bit of good humor thrown in. Gallery Orange is all about serious art that doesn’t take itself too seriously. 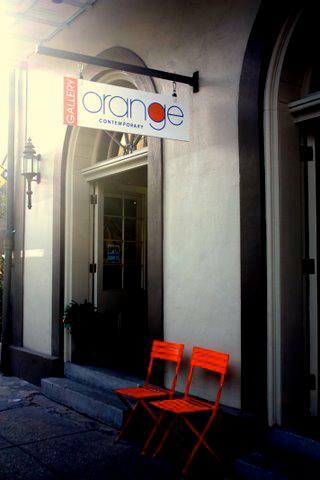 If you are in New Orleans or planning a visit, do not miss a trip to Gallery Orange! Delightful, deliciousness awaits you! You can see a list of upcoming shows at GO on their website— which is newly redesigned, make sure you check it out! All images are courtesy of Gallery Orange. New Orleans is one of those places that is unlike any other. It is unique in it’s history, traditions and way of life. Artists of all kinds, writers, musicians, painters, are attracted to its vibrancy and joie de vivre. In this most European of American cities, the arts are not just a weekend hobby of the 1%. Creativity is an ingrained part of daily life. Each day is touched by artists in some way. And today, as the town celebrates the most New Orleansish day of Mardi Gras, I thought we’d explore NOLA through the eyes of its artists. As I was thinking about what makes New Orleans such an extraordinary place, six characteristics kept coming to mind..
No doubt New Orleans is famous for its cuisine.. a bit French, a bit Southern.. totally deliciously unique. Jambalaya, po’ boys, beignets, shrimp creole.. I would be perfectly happy to eat my way through the city! Artist Carlos Lopez celebrates the simplicity and purity of New Orleans cuisine in his still lifes of oysters found in the city’s gulf waters. New Orleans Jazz is the soundtrack for the Delta. The horns, the banjo, the bass.. you can’t help but tap your feet. NOLA artists George Schmidt and Frank Kelley, jr., capture the energy that flows from the melodious sounds of Dixieland jazz. Though currently living in Florida, artist Yvonne Lozano’s Delta roots still show through. The city’s architecture reflects the diversity of its history and inhabitants.. from grand antebellum mansions to the European-influenced ironwork of the French Quarter to humble shotgun houses, each illustrates a facet of the city’s rich culture and history. And, of course, each has been a source of inspiration for artists such as Grant Schexnider, whose Shotgun Series celebrates the spiritual wealth found in these humble abodes. New Orleanians have a style all their own. Unfailingly friendly and hospitable, but direct and unafraid to tell it like it is. But always with charm and high style. The stylishly cheeky work of NOLA artist Sarah Ashley Longshore fits the city like beads on Mardi Gras. Joyful. Exuberant. Even in the face of darkness and destruction, every day in New Orleans is a celebration of life. Ally Burguieres’ work shines brightly with the fire of the people of New Orleans. The final and most enduring characteristic of New Orleans is the strength of its community and culture. Poverty, disease, disaster, destruction. The city has seen it all, yet through each trial, comes out on the other end that much stronger. Cory Willingham’s work explores the inner strength found when a community is called upon to rebuild. New Orleans isn’t just party central at Mardi Gras. It is a community filled with artists who are serious about preserving the city’s history and not just persevering, but thriving into the city’s future. It is a city that loves its artists and they return that devotion a hundredfold. 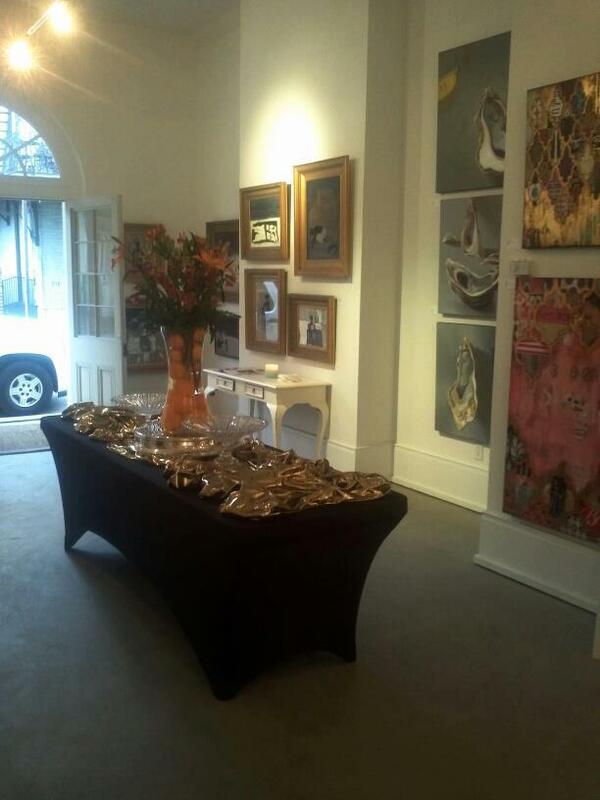 We’ll continue the NOLA love tomorrow, when Artsy Forager features a NOLA gallery bringing a fresh and contemporary, yet uniquely New Orleans style to the French Quarter! All images are via the artist’s websites linked above, unless otherwise indicated. 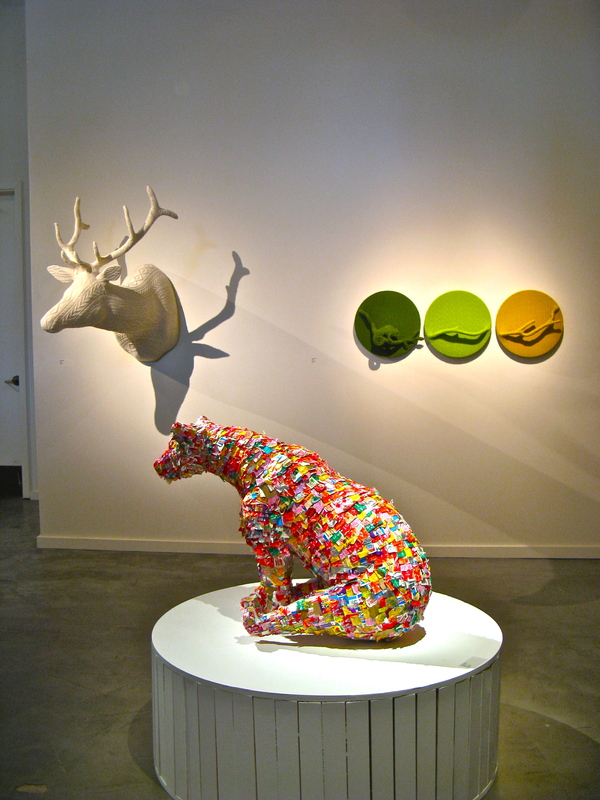 Images by Carlos Lopez and Sarah Ashley Longshore are via Gallery Orange.